It took 36 years but it finally happened. I landed my first gig as a celebrity DJ. 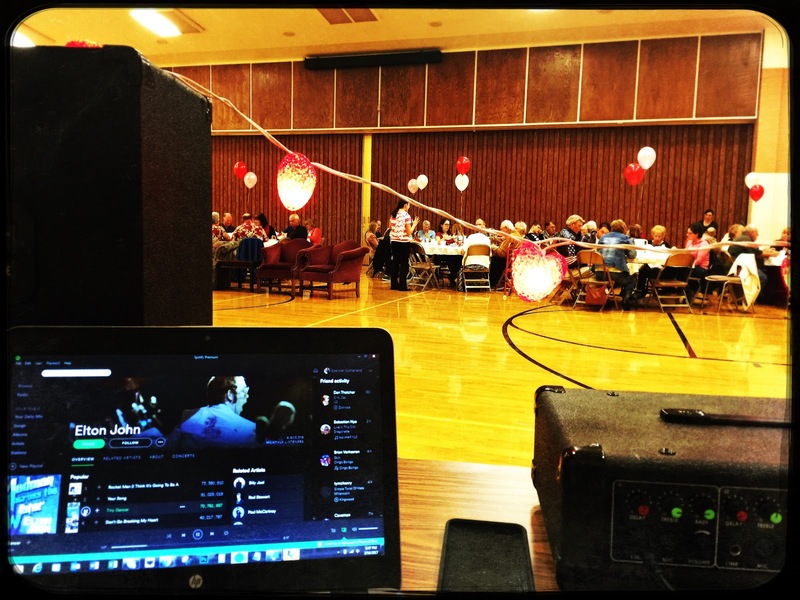 The assignment was simple enough: Play an hour of songs that will appeal equally to 20-year-olds and 90-year-olds...and everyone in between. Sure, it was a tough challenge, but the price was right: I was guaranteed a plate of chicken cordon bleu -- and, if I did a good job, a slice of pie at the end. I was feeling a lot of pressure as I prepped for the big night. What if no one dances? What if the old people hate it? What if the young people hate it? What if a swear word slips in there and the bishop gets mad? What if they take away my chicken cordon bleu? I worked and reworked the set list -- pushing Elvis up, moving Glenn Miller back, sticking Alphaville in the middle, ditching Simon and Garfunkel entirely. And then, before I knew it, was time for action. The lights dimmed (the neon lights stayed at full strength), the crowd stood and cheered (stayed seated in the metal folding chairs), and waited for the beat to drop (wondered when the Young Women were going to bring out the dessert). The ghost of Jim Morrison whispered in my ear, "The time to hesitate is through." I scrolled through my playlist. The Village People took care of the rest. Needless to say, I earned my slice of pie.